Andrew Lincoln's nine-season run as hero Rick Grimes ended with Sunday's episode of "The Walking Dead." The British actor announced in July that he would be leaving the role this fall, but how the former sheriff would be written off the show was not revealed until now. Lincoln's final scenes began with Rick impaled through the abdomen by a piece of rebar on a cement block as hordes of zombies approached. Rick managed to pull himself off the metal, crawled to his waiting horse, hopped on and escaped. Finding an abandoned cabin in the woods, he did his best to dress his wounds, then drifted in and out of consciousness where he saw the vision of the late character Shane, played by Jon Bernthal, who taunted Rick about decisions he made until he woke up to find his hiding place overrun by the undead, forcing him to flee via horse again. He also imagined comforting conversations with father figure Hershel, played by Scott Wilson, and his friend Sasha, played by Sonequa Martin-Green. Throughout his ordeal, Rick kept saying he needed to find his family. His wife Lori, played by Sarah Wayne Callies, and Carl, played by Chandler Riggs, were killed off in earlier seasons. The episode also featured a tearful confrontation between Rick's longtime ally Maggie, played by Lauren Cohan, and Rick's girlfriend Michonne, played by Danai Gurira. Maggie wanted to kill the imprisoned villain Negan, played by Jeffrey Dean Morgan, but changed her mind when she saw he was frail and non-threatening. Before the women could discuss the matter further, they were called away. They arrived with all of their friends, including Norman Reedus as Daryl and Khary Payton as King Ezekiel, in time to battle the zombies chasing Rick. Michonne found her injured partner and assured him she would take care of him. "It's not over. You don't die," she told him as he nodded. "You want to know why I fell in love with you? Because you are a fighter and you won't ever give up. So, fight, Rick. Fight for me. Fight for all of us." "You're my family. I found you," he said, then adding, "This isn't real." "Yes, it is," Michonne said. "Now, wake up!" 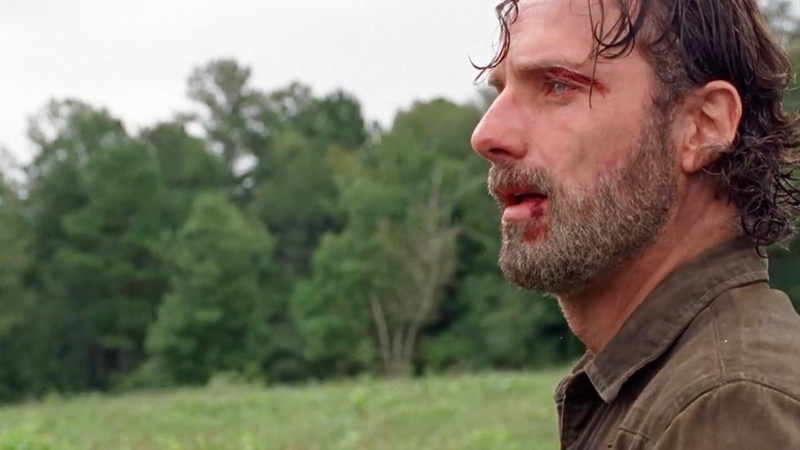 Rick regained consciousness, realizing this was just another hallucination and found himself in the middle of a road. In the show's last moments, he led the zombies onto an unstable bridge, in the hopes it will collapse under their weight, causing them to fall into the river below. It doesn't and Rick fights the zombies, as his friends arrived, this time for real. Michonne screamed, "Rick!" just as he mumbled to himself, "I found them," and fired his gun at a bundle of dynamite on the bridge, blowing up the crossing and countless walkers. Daryl is alone when he witnessed the event and had tears streaming down his face. Michonne was inconsolable as Maggie and Carol, played by Melissa McBride, tried to hold her back. Rick is presumed dead, but in the final moments of the show it is revealed that Jadis, played by Polly McIntosh, found him washed up on the river bank, injured but still alive, just as she is talking on a radio to someone and a helicopter is preparing to land. The last time Rick is seen is on the aircraft with Jadis. It is unclear who is transporting them or where they are going. A several year time jump is suggested when a tween-aged girl wearing Rick's sheriff hat and carrying a katana sword helped a group of strangers from walkers, introducing herself as Judith Grimes. Rick and Michonne's daughter was seen earlier in the episode as a pre-schooler.